Field trip to Mars analog site of Badwater with Dr. Susanne Douglas, (right). Many areas of Death Valley have groundwater springs which rise at the edges of the salt pan. The resulting salts which form are called evaporites and these evaporites are inhabited by a variety of different microbial communities. 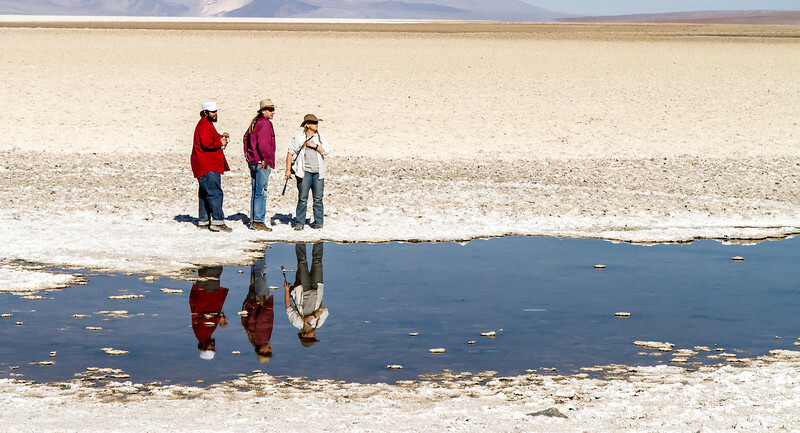 Within these evaporites, the communities find protection from harsh light and fluctuating water levels and, in turn, affect the mineralogy of the salts they inhabit. These mineral-dwelling microbial communities are analogues for possible life forms in the evaporites of Mars, and are being studied in order to define what needs life has in an evaporate environment. We will be touring a number of pools at Badwater. These pools are within hundreds of meters of each other yet have differing chemical compositions. We will see different types of microbial communities in these pools and the minerals they produce. If you have a magnifying glass, you may wish to bring it. We will be traversing some rough, but flat ground and handling samples that will dry your hands.